Posted on September 23, 2013 by Sarah J.
Dragons, magic, elves, dwarfs, and war are all common elements of many stories. Eragon was one of the first I have read that has a dragon that is actually a main character not a main supporting character. Excellent read for anyone who likes the things I listed above. 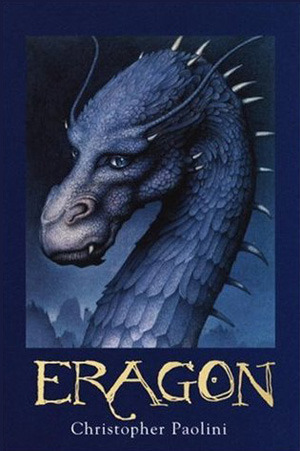 Eragon is the first book of a currently four-book series called The Inheritance Cycle written by Christopher Paolini. The book is about a boy named Eragon. Eragon has always believed he was just a normal farm boy with a normal birth. He knows nothing of his mother nor nothing of this father. He was raised by an uncle of his and lived with his uncle and his uncle’s son on their farm. Eragon lived a kind of shelter life from most of the outside world since the valley that he lived him was rarely visited from the outside. One day he finds a polished blue stone. This stone would bring him out of his simple life and the valley in which he lived. This stone would bring a dragon into his life that will lead him to magic, elves, and a whole host of other creatures and humans. Eragon is a very well-written story. The story is very well planned out and detailed– not in the way that bores people but holds their interest. Each character seems to have some sort of mystery behind them that makes the reader want to discover more. The main character, Eragon, still makes mistakes like a normal person and admits that he does them. This makes him feel more like the reader. Another thing that is interesting in this series is the diverse amount of species in the story. There are not only plenty of different sort of humans but there are also things like Urgals (Read the story to find out more about these creatures). In the end, this book is amazing. Well, at least for me. It has plenty of adventure and excitement for both male and female readers. This book and the complete series itself, I personally would recommend it to older or more advanced readers. The reason is that some of the more emotional side of the story can be hard to understand and take in some of the time. This series also deals with a lot of fighting, war, betrayal, and other slightly more mature things. This review is only my opinion. Really it is up to you. Have Fun! Extra Note: If you would like to learn more about the author of the Inheritance Cycle series, check out Phillip X.’s post about Christopher Paolini. This entry was posted in Book Reviews and tagged adventure, book review, Christopher Paolini, fantasy by Sarah J.. Bookmark the permalink.